Iranian expatriate Ali Samadi Ahadi's documentary concerns a crucial moment in recent Middle Eastern history: the so-called Green Wave (also known as the Green Revolution) was the reform movement in Iran among intellectuals and young people in the spring and summer of 2009 that hoped to take out President Mahmoud Ahmadinejad and replace him with reformist Mir-Hossein Mousavi through democratic elections. There was a promise of a new blossoming of democracy. Thousands braved the streets, like demonstrators in Egypt in January 2011. When Ahmadinejad won by a landslide, indicating a fixed election, the strong negative response was brutally repressed. Though it failed, this movement, with its reliance on new media like Twitter and Facebook, may have been the first strong example of the spirit of revolt against repressive regimes that is currently sweeping across the Arab world. Ahadi integrates Facebook reports, tweets and videos posted on the Internet into the film along with drawings and animations as well as archival street footage of the cell-phone kind often seen on Al Jazeera and talking heads, which include young dissidents beaten and imprisoned during the uprising -- and in a formal interview among many, Shirin Ebadi, the stolid but forceful Iranian Nobel Peace Prizewinner. Despite all this The Green Wave, not entirely through the fault of the filmmaker perhaps, is both essential and disappointing. It is not only an anguished cry of despair but lacks the seeds of new hope, and there's more weeping than shouting, so you wonder where the courage went and what can be and is being done now. The format gives rise to comparisons with Ari Folman's Waltz With Bashir, the vivid Israeli film that combined animation with documentary, as well as Persepolis, Vincent Paronnaud and Marjane Satrapi's animated summing up of her graphic novel autobiography. The Green Wave's drawings and animations may show some stylistic debt to both of these, but this film is not as involving and strong as they are, nor, despite the use of so-called "real-time" Twitter or Facebook entries, is it as innovative. Nonetheless Ahadi does his conventional job of describing the events of 2009 in Iran well, with many voices heard from and a day-to-day account of the main events. The disappointment is in the context of more recent revolts, the failure to delve deeper into the movement's orgins, its leadership, its organization, and its current status. Mostly this film turns out to be a lament, one long wail, underlined by the frequent use of a cello background. There are many tears, and much hopelessness. And there is no great subtlety in the emotional propaganda. As Variety critic Leslie Felperin notes, "Characters in the animated material, for instance, are often posed in such heroic stances they recall propaganda posters from the Soviet era," and Ali N. Askin's string-heavy score "attempts to milk the tear ducts with such ferocity, some [audiences] may feel bullied by the string section." The most memorable segments are the excerpts of blogs voiced by actors Pegah Ferydoni and Navid Akhavan and brought to life with animations by Ali Reza Darvish in as style like that of a graphic novel. Two of the accounts (neither identified by name) are by a youthful protester who was later arrested and tortured, and a young female supporter of who works for opposition candidate Mir-Hossein Mousavi's election campaign. The film establishes what is already well known: that polls indicated Moussavi would win by a wide margin and that the negative reaction to his questionable defeat was brutally repressed, with the blessing of Iran's supreme religious leader, Ayatollah Sayyed Ali Khamenei. The shot of Khamenei putting the seal on Ahmadinejad's fake reelection with a kiss is one of the most repellent in the film. Also interviewed, besides Shirin Ebadi, are journalist and Green Revolution eyewitness Mitra Khalatbari; law professor Payam Akhavan; human rights lawyer Shadi Sadr; journalist/blogger Mehdi Mohseni; and Shiite cleric Mohsen Kadivar -- all strong opponents of President Mahmoud Ahmadinejad. Some may need to know that Ahmadinejad is unpopular and, like the Arab leaders, is a despot. Most who follow world events will be aware of this, and may want a little more searching reportage than Ahadi provides. It might be more interesting just to know how he made this film, and where. He lives in Germany, where the film was produced. The most hopeful note we get comes toward the end of the film when former UN prosecutor Payam Akhavan calls the Green Wave as “seismic shift, the democratic tidal wave” and says that eventually the oppressors who quashed it, whose actions are recorded here and elsewhere, will be brought to justice. "They have to understand that their crimes are being documented, are being recorded, and a day will come when they have to answer.” Yes, but where, how, and when? 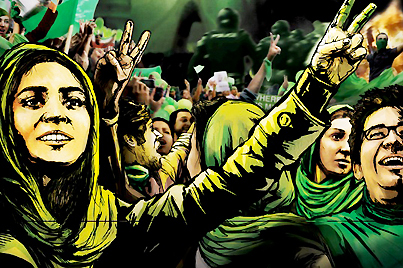 When will the predominantly youthful population of Iran have a voice? The Green Wave was first seen in Germany, where it had a theatrical realease in February 2011. Its US debut was at Sundance in January 2011. Seen and reviewed as part of the San Francisco International Film Festival, April-May 2011.